Donald Trump is president. Now what? 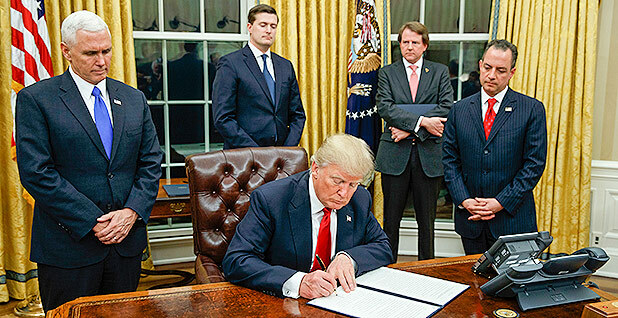 President Trump, flanked by Vice President Mike Pence (left) and Chief of Staff Reince Priebus, signs his first executive order on Friday just hours after being inaugurated as the 45th president of the United States. Photo courtesy of AP Images. President Trump used the opening hours of his presidency to hint at dismantling Democratic climate policies, but his first executive actions prioritized the unraveling of Obamacare over the environmental actions of his predecessor. His order Friday to begin unraveling former President Obama's signature health care law reveals the political importance he places on overhauling a measure that has galvanized Republican opposition for almost eight years. His administration also ordered federal agencies to freeze all unfinished regulations until they're examined by incoming Trump officials. No executive announcements were made to remove the cornerstones of Obama's climate agenda. Still, symbolic steps were taken that could foreshadow action against the Clean Power Plan and the Paris Agreement on climate change, according to a transition official. "I would point out that taking down the White House climate change webpage immediately after the inauguration could be a sign of things to come," the official said. Trump opposes both programs. His administration emphasized that within minutes of his inaugural address by scrubbing the White House website of climate-related content. Search results now link readers to the "America First Energy Plan." It focuses on expanding oil and gas development and mentions carbon capture and sequestration. The one-page document describes the Clean Power Plan, which requires the power sector to cut carbon emissions 32 percent by 2030, as "harmful and unnecessary." It adds: "The Trump Administration will embrace the shale oil and gas revolution to bring jobs and prosperity to millions of Americans. We must take advantage of the estimated $50 trillion in untapped shale, oil, and natural gas reserves, especially those on federal lands that the American people own." It's unclear when the administration might strive to roll back Obama's key actions on greenhouse gases. One source close to the transition believes the president could begin announcing his decisions to upend the Clean Power Plan and Paris when his agency nominees are closer to being confirmed. That begins today, when the Senate Foreign Relations Committee votes on Rex Tillerson's appointment as secretary of State. Trump is scheduled to sign several executive orders this morning. It's not unusual for an incoming administration to restructure the White House website, but environmental advocates said they were concerned by the speed with which specific climate content was targeted. "I'm not surprised that he would remove it in general," said Gretchen Goldman, research director with the Center for Science and Democracy at the Union of Concerned Scientists, adding that it's "unnerving to see that it was clearly a top priority for it to already be wiped clean." Alarmed at the prospect that the new administration might edit or erase data sets used by climate scientists, environmental groups are trying to protect them. Goldman said UCS is targeting the scientific integrity policies that agencies put in place during the Obama years for fear that they might undergo a stealthy edit. The policies include rights for federally employed scientists to speak to the press, whistleblower protections and other safeguards to prevent political appointees from meddling in research. The Trump administration swiftly took down the Obama administration's websites touting work on climate change. The Environmental Defense Fund, meanwhile, filed a request under the Freedom of Information Act to see what climate and air quality information had been removed between Thursday and Friday. "Given the president's statements about climate science, there is widespread fear that the administration will remove scientific information based on politics or ideology," said Keith Gaby, an EDF spokesman. "We're just seeking to track the changes and the discussions around those changes." Trump didn't mention his opposition to Obama's climate actions during his inaugural address. Some observers in seats below the Capitol balcony from which he spoke agree with that decision. The issue of global warming just doesn't seem to be that important to them — one way or the other. "I believe God's in control, and we've got to be good stewards," said Ken Crider, 51, of Livonia, Mich. He said it's "arrogant" when people say they can change the weather. Not everyone on the teeming Capitol lawn saw it that way. Sean Garvey, an 18-year-old student from California, said he's "attracted" to Trump's strong personality and his success in business. But he disagrees with him on climate change — or at least on the position that Trump espoused in a 2012 tweet describing it as a Chinese hoax. 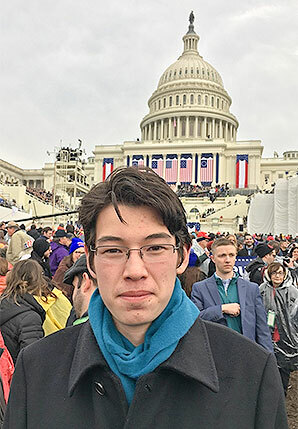 Sean Garvey, 18, traveled alone from California to see Trump be sworn in. Photo by Evan Lehmann. "Obviously, that's not true. I don't believe that," Garvey said. "It was on Twitter, so I don't think it can be taken as seriously as if he said it in a speech." Garvey, who spent the night before the inauguration in Union Station instead of getting a hotel room, said he would be "disappointed" if Trump's policies as president reflect the idea that global warming isn't happening. "But I think his other actions [on taxes, for example] would make up for that," he added. On the fringe of the National Mall, Jessica Barjaktarovich and her friend had just seen Trump sworn in. Both had supported him throughout the primary elections, and they drove all night from Michigan to see him take the oath. "It's a hoax. I'm just not going to believe everything that's thrown in my face, by the media especially," Barjaktarovich said of climate change. "I'm not going to be naive." Climate activists also marshaled in force. Hundreds blocked the security checkpoints at one of the entrances to inaugural events. They chanted slogans like "Trump's cronies have to go, no Exxon CEO," a reference to Trump's appointment of the company's former head, Tillerson, as his secretary of State. Many of their banners were created by artists in New York, who used 100 feet of muslin to paint messages on white banners that could be carried by three people abreast. Trump's election was a setback for the climate movement, said Rachel Schragis, 30, a social movement artist who helped create some of the banners. And that has left artists struggling to create the sort of imagery that gives climate activists and environmental justice advocates something to rally around. Climate change protesters at Trump's presidential inauguration. Photo by Alex Doukas. "It's hard to know what to paint on the banner," Schragis said. "What is our message when we've just had to take a giant step backwards?" She and artist Gan Golan, 43, also of New York, deliberately chose simple red, white and blue text-based imagery for their banners. The visual lexicon "of being proud of who we are" as Americans is something held by the right, Schragis said. One of the main banners played with the imagery of sea-level rise, with the words "Deny Trump, Not Climate" in capital letters. The bottom line is on a blue background, with wavelike shapes separating it from the top. 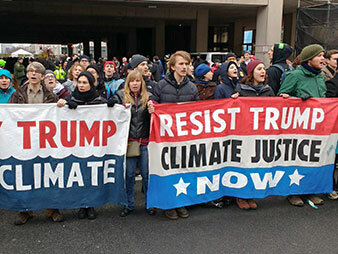 Their other main banner, "Resist Trump, Climate Justice Now," uses the buntinglike imagery of an old-fashioned political rally, including white stars on blue, much like the U.S. flag. "Let's make America great by leading on climate for the rest of the world," Golan said. Reporters Jean Chemnick and Daniel Cusick contributed.